The team from Botswana consisted of two Community Officers (Ms. Mubuso Kakambi from the Chobe Enclave and Mr. Charlton Kefenyang from Khumaga) who have been working with WildCRU since October 2017. They facilitate community consultation meetings, offer translation of spoken and written material and act as the main contact between the community and WildCRU. Newly recruited Community Guardians who were invited to this training were Mr. Ngandwe Museke (Chobe Enclave), Mr. Botsanang Gaborone, Mr. Unoziba Molosiwa and Ms. Us Ditshenyegelo (Khumaga). The team travelled to two project sites in Zimbabwe (Figure 1). The training team and trainees camped throughout the training, initially at the WildCRU offices and subsequently we were kindly hosted at the Hwange National Park Ngamo Ranger Gate and Sodaka Clinic in Tsholotsho. Cooking duties were shared amongst the team, and transport was provided via project vehicles. 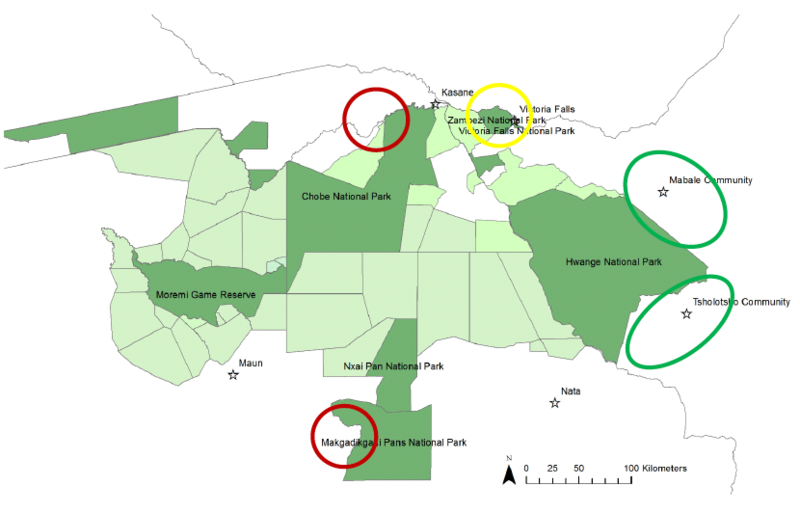 Figure 1: The WildCRU Community Guardian project sites in Botswana (red) and Zimbabwe (yellow shows the Victoria Falls Wildlife Trust area and the two green circles indicate two communities where WildCRU operates on the boundary of Hwange National Park; Mabale and Tsholotsho areas). After crossing over the border from Botswana to Zimbabwe, we overnighted with the Victoria Falls Wildlife Trust (VFWT), spending time over two days with Mr Roger Parry (Wildlife Manager) and Mr Bongani Dilodlo (Human Wildlife Conflict Manager) and visiting communities residing adjacent to the Victoria Falls National Park. The trainees were given a tour of the well-equipped forensic and laboratory facilities at the VFWT, whilst also having an opportunity to meet a rescued wildlife education ambassador; ‘Judge’ the white-backed vulture. We travelled out to the community areas to meet VFWT Community Guardians and visited a syndicate of nine famers utilizing a mobile kraal. Mobile kraals are communal kraals that use thick canvas sheeting to protect cattle overnight, and can be moved to the agricultural fields during the non-cropping season, allowing manure to fertilise the soils. In both countries, the concept of pooling cattle from multiple owners into a single kraal overnight presents challenges; cattle owners are understandably reluctant to put their resources together. However, the benefits of working together to defend livestock from predators, as well as using mobile kraals to fertilise cropping fields, have been realized by this community, who are proud to have been provided with the mobile kraal. We also visited the site of a recent livestock attack incident, to learn how to conduct conversations and collect data with farmers that have experienced a loss. The importance of collecting reliable and consistent data was emphasized to our new trainees. From the Victoria Falls area we travelled south to the WildCRU headquarters in Mabale, adjacent to Hwange National Park, where an extensive and comprehensive training programme was created by Liomba Junior Mathe, Lion Guardian Project Manager in Zimbabwe. To introduce the concepts of community and wildlife guardianship a full day of lectures and practical training was held at WildCRU HQ. This included information about the history of WildCRU’s research and community work in southern Africa, and the general ecology and behavior of lions. The afternoon sessions focused on the use of GPS and lion collar tracking technology, which the Botswana team had never been exposed to before. Satellite and VHF tracking collars are deployed on lions which regularly cause conflicts in community areas, and have allowed the Zimbabwean team to set-up an ‘early warning’ system. This alerts livestock owners and herders when a conflict animal has entered the community lands and allows them to make informed decisions about releasing their cattle from kraals and where to herd them for grazing. Over the course of the next two days, the team met with local chiefs and headmen, as is customary when visiting new areas, completed a 5km fitness run, carried out assessments of livestock herds and the use of different types of kraal. Visits were also made to other conservation organisations in the area; the Painted Dog Conservation Education Centre and the Soft Foot Alliance and Co-Herd Project. On our fifth day of training we moved camp again, travelling through Hwange National Park to reach the southern Ngamo Gate entrance where we had the privilege of camping for two nights. Community Guardians were able to assist in WildCRU’s Livestock Health Programme, by taking part in vaccinating cattle against common diseases, and were briefed by Hwange’s Scorpion Anti-Poaching Unit. The following day the focus shifted from livestock to wildlife, with an educational game drive in the National Park followed by practicing radio tracking of real lions residing in the park. Unfortunately, the thick bush prevented us from seeing them on this occasion, but our tracking gear informed us we were close! A simulated lion chase event was orchestrated to give our new recruits a feel for tracking and moving lions in the bush (Figure 5). Lion ‘chase’ events refers to times when Guardians work as a team to encourage lions that have moved into community areas to move back to the safety of the National Park. These chases are carefully conducted patrols carried out on foot using noisy vuvuzelas, as well as shouting and banging sticks, to create an unwelcome environment for lions in a particular area, thus encouraging them to retreat. Safety and teamwork are of paramount importance. Despite knowing no lions were in the area, the thrill of conducting such a drill was palpable amongst the teams, and Liomba’s sudden jump out from behind a bush more than startled most of us. Our final days training were spent camping at the Sodaka Clinic in Tsholotsho communities. The clinic not only hosted our group, but also gave us a basic first aid lecture, covering some of the most likely medical scenarios a Guardian may face in the field. We travelled for several hours on dirt roads to reach one of the more remote areas covered by the Guardian project, the Pelandaba cattle posts. Here, we met herders, carried out kraal assessments and discussed the effectiveness of kraal designs in keeping predators away from livestock at night. Our training was completed by a return drive through Hwange National Park and the presentation of certificates to our trainees.